Baroness Masham of Ilton speaks against assisted suicide. 17:00 Thank you for following our live blog. At this stage, following Baroness Howe’s speech, there were 45 speeches against the Bill and 45 speeches in favour of the Bill. Continue watching here. 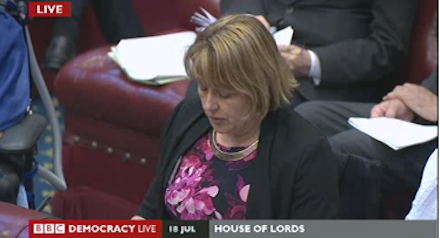 16:56 Baroness Howe of Idlicote says that she has received lots of letters and they are all opposed to assisted suicide. She argues that the title ‘Assisted Dying’ Bill is worryingly vague and that the safeguards in Lord Falconer’s Bill are too flimsy. 16:50 Lord Finkelstein supports the Bill and argues that ‘fear of being a burden’ is not a reason to oppose legalising assisted suicide. The reasons for opting for assisted suicide should not matter says Lord Finkelstein;it is up to the individual why they choose assisted suicide and is no business of the state. 16:40 Our live blogging will stop at 5pm but you can follow the debate live here. 16:39 Baroness Kennedy of the Shaws opposes the Bill. She argues the Bill carries us across an important line and will change the moral landscape. “It is a fundamental principle of law that we should safeguard life and it’s too important to abandon it.” She asks how many people in our communities have real choice and says that sociey is becoming a “harder place” and is full of people who have very few choices. 16:30 Baroness Young of Old Scone, who supports the Bill, argues that health care professionals are too scared to discuss patient’s options for fear of prosecution. 16:26 Lord Singh, who is Sikh, says there is an “unhealthy obession” with the indiivudal driving a change in the law, which he opposes. He argues that the Bill moves us away from enhancing care and might encourage greedy relatives to pressure vulnerable family members. 16:20 Viscount Eccles is opposed to the Bill and argues that while there is still much to do in palliative care, licensing assisted suicide is not the solution. 16:07 Baroness Masham of Ilton, who is paraplegic, tells the House that the majority of disabled people oppose assisted suicide. She argues that doctors should not become “killing machines” and reminds the Lords about the “monster” Harold Shiplam who killed his patients. 16:06 Lord Howarth argues that civilisation is always fragile and that he is horrified that we might have a society where it becomes routine to end the lives of the elderly, sick and disabled. 15:58 Lord Condon, who opposes the Bill, tells the House: “I just cannot overcome the reservations I feel.” He says that there is an absence of detail in the Bill about safeguards and that the current law works. He also predicts that many elderly and disabled people will become “diminsihed and downgraded” if this Bill becomes law. He calls for a Royal Commission to look into the case for legalising assisted suicide instead. 15:55 Lord Graham of Edmonto, supports the Bill, he tells the House that his cab driver this morning asked him to support the Bill. 15:53 You can access the full text of Baroness Campbell’s speech here. 15:42 Lord Gordon of Strathblane, opposes the Bill and says it is not about assisted dying and assisted suicide. We currently treat suicide as something not be assisted and something to be prevented, argues Lord Gordon and says that no one in the chamber would encourage a terminally-ill person to jump of a bridge but try and persuade them to think again. 15:55 Baroness Neuberger opposes the Bill because she doesn’t think doctors should be involved with assisting suicide based on the findings of her inquiry into the Liverpool Care Pathway. She also expresses concerns about the requirement of a 6 month prognosis because her own mother was given a prognosis of a few weeks and went on to live for another 5 years. 15:25 Lord Browne of Belmont, who opposes the Bill, says that since the inception of Oregon’s Death wtih Dignity Act, there have been 22 serious complications with assisted death and 6 people have regained consciousness following ingestion of the lethal dosage. He also referred to a ComRes poll which shows that initially 73% of people support a change in the law and 12% oppose a change but when they are made aware of the public safety risks, only 43% support assisted suicide and 43% oppose it. 15:00 Viscount Colville, who opposes the Bill, says that he has received a letter from a psychiatrist who warns him about the difificulties of assessing mental capacity and the risk of assisting someone to die because they are clinically depressed. 15:00 Baroness Morris of Bolton recalls that she suffered a riding accident in her youth. She was in intense pain, depressed and didn’t know if she would walk again. She stockpiled pills in case she decided to commit suicide. She says a nurse befriended her, gave her hope and helped her to recover. She says that if the Bill had been passed then she might have sought help to die, rather than gone on to live a fulfilling life. 14:57 The former Archbishop of Canterbury Lord Carey speaks in favour of the Bill. He says his critics say his U-turn on the issue is light on theology. He says his theology is one of accompanying the dying in their darkest moment and treating them as the he would wish to be treated. This is theology of the very best kind, he says. Baroness Butler-Sloss is speaking now and is the 30th peer to speak against the Bill. 30 have spoken in favour so far. 14:10 Lord Winston speaks about his mother during her final days and the poor standard of care she received. He opposes Lord Falconer’s Bill and warns against the impossibility of regulating attitudes among the medical profession which will worsen under legalised assisted suicide. 14:02 Lord Cavendish of Furness, who opposes the Bill, tells the House that he has received 30 letters and only two supported the Bill. Care of elderly can be brutal enough already. Bring in assisted dying & how many mute frail elderly will be "assisted" to die? 13:50 The Bishop of Bristol tells the House how nearly 60% of people who opted for assisted suicide in Washington State last year said that they did not want to be a burden. 13:44 Baroness Warnock, long time supporter of assisted suicide, who once said dementia sufferers were “wasting people’s lives,” argues in favour of the Bill. I wasn’t expecting the mention of a miracle by a Catholic Priest in this debate! A powerful speech by Baroness Nicholson of Winterbourne. 13:22 Baroness Grey-Thompson tells the House that she is worried a change in the law will be extended to disabled people. 13:16 Baroness Wheatcroft, who supports assisted suicide, tells the House that when her mother was dying of Leukaemia if she’d been offered a loaded gun she would have fired it. 13:07 Baroness Symons tells the House how her husband was diagnosed with terminal cancer and was given a few months to live, 22 years ago and that he wanted to end his life. He is still alive today and Baroness Symons tells the House that she is so glad that her son still has a father and that she still has a husband. 12:51 Former DPP, Lord MacDonald of River Glaven opposes a change in the law and emphasises that the current law allows for discretion. He says it would be foolish to assume that everyone who assists a suicide acts with pure motives. The former DPP adds that it is right that the “deliberate infliction of death” should always be investigated even if it doesn’t result in prosecution. 12:22 Baroness Campbell of Surbiton says that this Bill will reverse the culture of care where she will be helped to die rather than to live. She argues that pain and suffering should always be treated and she has learned through experience that there is no situation which cannot be improved. She says the Bill is motivated by fear and pity. 12:21 Listen to Baroness Campbell of Surbiton explain why the ‘Assisted Dying’ Bill scares her. 12:10 Lord Harries of Pentregarth, who opposes the Bill, asks why we have less compassion for someone diagnosed with a lifetime of suffering ahead of them than someone who is expected to die within a few months. 11:53 Lord Brennan, former head of the Catholic Union, says that the Bill favours the few invulnerable against the majority vulnerable. He appeals to the House to be realistic about the implications of the Bill, whch dismantles the Hippocratic Oath. He says that legislating for hard cases nearly always produces bad law. 11:48 Baroness O’Cathain urges the House to remember the vulnerable when debating the Bill, which she opposes. She argues that many letters she receives in favour of assisted suicide make her think about addressing the depression of the terminally-ill rather than assisting them in their suicide. 11:43 Madeleine Teahan responds to Guardian columnist, Polly Toynbee’s article in favour of assisted suicide. 11:37 Lord Mawson, a clergyman who deals with the dying and grief, opposes the Bill because he recognises that people can behave irrationally when they are grieving. He argues that we are not islands but our actions affect one another. 11:12 So far there have been 9 speeches in favour of the Bill and 4 against. 11:09 Lord Avebury is a Buddhist and supports the Bill because of the Buddhist principle of compassion. 11:04 Have you read this piece about a concert pianist whose experience of caring for his terminally-ill mother persuaded him to oppose assisted suicide? 11:03 Lord Joffe, who introduced an assisted suicide Bill in 2006, says that there is no evidence of a slippery slope in Oregon and argues that mentally competent patients are already allowed to refuse life-saving treatment. 10:52 Baroness Greengross argues that the Bill merely enables the terminally-ill, who are not capable of ending their lives, to be allowed to do so. 10:49 Lord Purvis of Tweed, who tried to introduce assisted suicide in Scotland, speaks in support of the Bill. He argues the Bill needs to strike a balance but “I believe now more than ever” for Parliament to act. 10:38 Archbishop Sentamu tells the House that human freedom is about being reconciled to the need to die and accepting the approach of death. He says that his mother defied all prognosis when she was diagnosed with cancer and this allowed her time to get to know her grandchildren. 10:36 If you would like to find out more about the background to the Assisted Dying Bill, you can read The Explainer here. 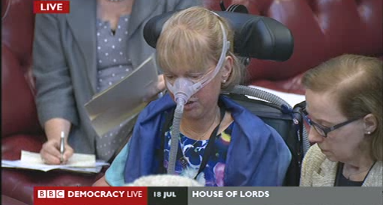 10:34 Baroness O’Neill of Bengarve argues that the current Bill does not assist the dying. It doesn’t support the choices of those who are dying or who need pain relief. She argues it does not, for example, support people who want to die at home rather than in hospital. 10:28 Lord Lester of Herne Hill is addressing the House now-he is a long-standing supporter of assisted suicide. Lord Lester argues that at the moment the only option patients have is to starve themselves to deat and are left in a state of uncertainty and anxiety. 10:26 Lord Dubs supports a chnage in the law partly due to the death of someone he knew who had motor-neurone disease. 10:14 Lord Falconer tells the house there will be a 14 day ‘cooling-off period’ after an assisted suicide request is granted. The patient would have to administer the medication themselves a healthcare professional must not administer the lethal dosage. 10:12 The Bill is based on Oregon’s experience not Holland or Belgium’s laws. Lord Falconer says that he rejects these laws. 10:10 Lord Falconer tells the House no one wants to see compassionate assisters prosecuted. The current situation allows the rich to go to Dignitas and the majority to rely on amateur assistance. The principle of this Bill is giving choice to the terminally-ill with strong safeguards. The Bill does not legalise voluntary euthanasia but assisted death. 10:00 Lord Falconer of Thoroton, who is sponsoring this Private Member’s Bill, is the first to address the chamber. Welcome to the Catholic Herald’s live blog. We will be bringing you the latest updates on the Second Reading of the Assisted Dying Bill, which is taking place in the House of Lord’s today. You can watch the debate live here.